Rev Fr Raymond McCullagh at a special ceremony to remember those who lost their lives in the Girona tragedy. 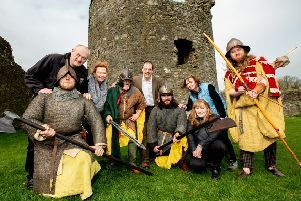 The event was held at St Cuthbert's Church near Dunluce Castle on the Causeway Coast, not far from Lacada Point where the galleass of the Spanish Armada foundered and sank in 1588. A memorial stone was unveiled at the church two years ago at the site of an unmarked grave where some of the Girona sailors were buried. The Mayor of Causeway Coast and Glens Borough Council Councillor Brenda Chivers has joined the Spanish Consul-General, Miguel Angel Vecino Quintana, at a special ceremony to remember those who lost their lives in the Girona tragedy. The event was held at St Cuthbert’s Church near Dunluce Castle on the Causeway Coast, not far from Lacada Point where the galleass of the Spanish Armada foundered and sank in 1588. The Mayor of Causeway Coast and Glens Borough Council Councillor Brenda Chivers had joined the Spanish Consul-General, Miguel Angel Vecino Quintana, and Dr Bob Curran who laid wreaths at a special ceremony to remember those who lost their lives in the Girona tragedy. A memorial stone was unveiled at the church two years ago at the site of an unmarked grave where some of the Girona’s sailors were buried. The story of the sinking has huge maritime significance as along with the many people who lost their lives, a significant horde of gold was on board the vessel at the time. The treasure lay undiscovered until over 50 years ago when a team of divers raised the treasure from the wreck. The service held on April 6 was part of an academic and cultural conference held at Ulster University in Coleraine as part of its own 50th anniversary celebrations. The memorial stone at St Cuthbert’s Church features an image of a salamander, in homage to one of the most noteworthy pieces of treasure recovered from the wreckage - a gold salamander set with rubies. It is particularly poignant because it was a favoured wartime talisman due to the mythical salamander’s powers of protection. The Mayor of Causeway Coast and Glens Borough Council Councillor Brenda Chivers had joined the Spanish Consul-General, Miguel Angel Vecino Quintana, at a special ceremony to remember those who lost their lives in the Girona tragedy.